I'm working from Istanbul this week and thought I would recap some of my favorite places to have breakfast. Although, I've been pretty good and avoiding a lot of the breads and sweets, it's still pretty hard to say no to them. Don't be on whole30 when you come to Istanbul especially if this is your first visit to this beautiful city. Khavalti (breakfast) or Turkish breakfast is a standout meal to have. If you have ever watched Anthony Bourdain's "No Reservations" show, one of the episodes had him visiting Istanbul and trying out different meals. His first meal was breakfast and he gets a brief lesson on the types of food they serve for breakfast. You can watch it here if you need a reminder. Turkish breakfast should be savored and enjoyed. You will see many places to have breakfast in Istanbul. Some places will have a magnificent view of the Bosporus, others will be tucked away in lively streets. I also think that Turkish breakfast is close to zero waste to the consumer. Because it is a sit down meal, everything will be served in actual plates and utensils. The concept of to-go is rare. It's a great way to really enjoy a meal and catch-up. Partake in fresh squeezed orange juice, fresh breads and many cheese options. 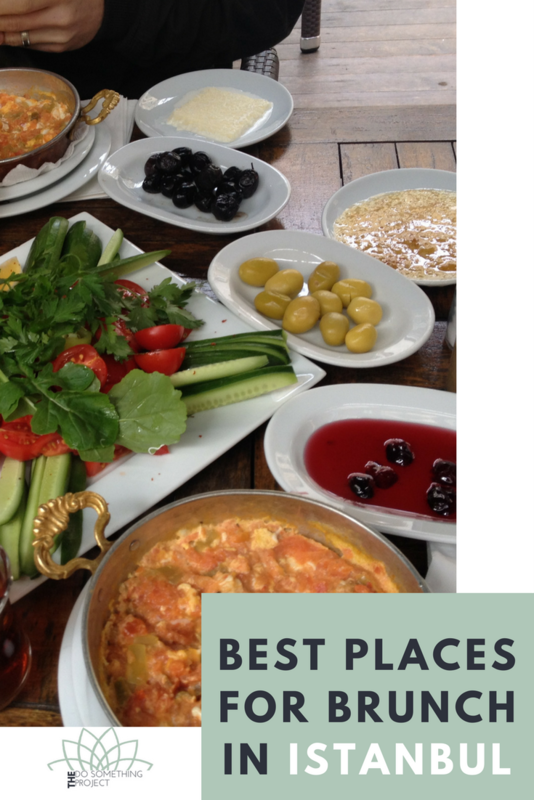 Here's my Istanbul guide on where to have Turkish breakfast. I would recommend skipping the hotel restaurant or Starbucks and partake in this wonderful experience while you are in Istanbul. Traditional breakfast with freshly cut tomatoes and cucumbers, freshly squeezed orange juice, variety of cheeses, scrambled egg (menemen) and various other goodies. If you are lucky enough to have family or be someone's guest in Istanbul, then breakfast at someone's home will be the top place to have this meal. It will definitely be prepared with love and care. Depending on your hosts, you may also get to partake in the host family's tradition. My husband's family live in Istanbul. They have recently started ordering organic and fresh fruits, vegetables, dairy and cheeses from a farm outside of Istanbul. Great way to enjoy some good, farm food. Check them out İpek Hanım Çiftliği. My favorite. Simit with kaymak and honey drizzled on top. Simit is similar to a bagel but made with molasses and sprinkled with sesame seeds. It's considered a classic street food. Kaymak is clotted cream and tastes so smooth. So many options here. Namlı Gurme is probably one of the most popular. On weekends, the wait can be close to an hour. This deli has many options to choose from and many varieties of cheese and meats to try. Next door is the famous Karaköy Güllüoğlu. If you have a hankering for some baklava or need to stave off hunger while you wait for Namlı, you can grab something small here. If you walk a few meters past Namlı, you can check out the many cafes and restaurants inside the main street. Just beware of the hipsters. Along the Kılıç Ali Paşa Mescidi Sokkak, you'll find many options for breakfast, lunch and dinner. This is the new trendy place to meet up. It has a cool, laid-back vibe with plenty of stylish people. The Istanbul Modern is also a few blocks away and a good place to check out some art. There is always some cool graffiti art on the side streets that are all Instagram worthy. Egg with Turkish sausage (socuk). That yolk is no joke. Istanbul is abundant in outdoor cafes. In fact, restaurants and cafes typically have an outdoor setup that is used practically all year. Heaters and blankets are provided to ensure you have a nice experience while dining outside. Midpoint Restaurant is a popular meeting place. One of the unique aspects of this is that their terrace which has a covered roof overlooks to the Topkapi Palace side. Always ask to sit closer to the edge so that you can experience the view while enjoying your breakfast. It's located in Taksim and while Taksim is generally pretty busy, you don't hear any of the noise from the outside interrupting your breakfast. This is menemen. Scrambled eggs with fresh tomatoes. The city of Van in eastern Turkey is famous for their breakfast. You won't have to travel there to enjoy Van's goodness. There are a few locations in Istanbul that serve Van's unique blend of breakfast items. Make sure you order the a variety of cheeses and the honey which melts in your mouth. Tahini (ground hulled sesame seeds) with molasses or honey, sprinkled with chopped walnuts. I may be partial to this part of town because my entire family lived in an Airbnb house in this neighborhood for our wedding. The restaurants by the water all offer great food. It's a little trendy and high end, but you will find great quality options for breakfast. Don't forget to walk by the Bosporus once you are done to burn off some calories. Freshly squeezed orange juice, olives, tomatoes, cucumbers and plenty of cheeses. This street is also known as Breakfast Street. It is in the heart of Beşiktuaş. You'll know you are in the right part of town when you see a large eagle statue. The eagle is the symbol for the Beşiktaş sports team. This street contains many places to have breakfast. It is popular with students as it is to close to many universities so you will see lots of student groups have breakfast before class. There are plenty of options for breakfast so select that ones that looks busy and enjoy your meal in this bustling part of town. Another take on the traditional breakfast plate. This one has some meat, borek (pastry) and more cheese, honey, jam and Nutella. This town sits close to the water on the Asia side of Istanbul. It offers a great view of the European side of Istanbul as well as views of the two bridges. The Asia side is much quieter, but you'll still experience an abundant breakfast with a wonderful atmosphere. Select a cafe or restaurant close to the water to fully enjoy the ambiance. I hope you'll have a chance to try an authentic Istanbul breakfast one day. If you have, tell me what your favorite food is. Don't forget that coffee is always served after breakfast. Khavalti which is Turkish for breakfast means coffee after. The famous Turkish coffee sipped by the Bosporus of course.